Rage 2 releases next month and the hype machine is heating up. Today, Bethesda Softworks announced a new He's On Fire Mode pre-order bonus for the game that features legendary voice actor Tim Kitzrow. Please take a look at this extremely awesome trailer. Tim Kitzrow is known for his work on the NBA Jam series, and he is bringing some awesome catch phrases to Rage 2 next month. Some awesome bits from this trailer include sayings like "rejected," "he's heating up," and "he's on fire." "Pow Pow Puppy Chow" and "Loud Noises" are some particularly hilarious sayings featured in the trailer, but fans of Tim's work will probably be happy to hear that "Boomshakalaka" and "from downtown" are also included in this super hype video. This might seem like an April Fools' Day prank, but Shacknews reached out to Bethesda PR to confirm this is real. The fast-paced fun of Rage 2 and Tim's signature voice acting are truly a match made in heaven. 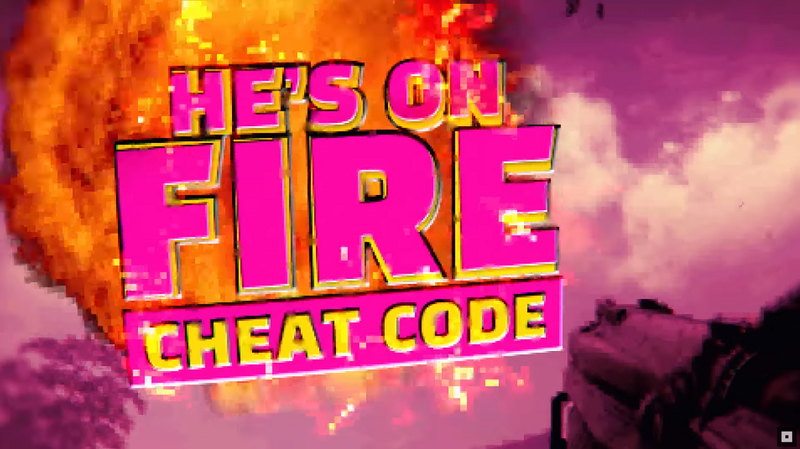 Players who pre-order the game will ensure that the He's On Fire cheat code will be there to prevent them from feeling "rejected." In a world of horse armor and other boring pre-order incentives, the He's On Fire mode truly stands out. Rage 2 appears to have found a brash marketing niche that has many gamers excited. The E3 2018 reveal featured a live performance from Andrew WK, which was totally rad, and the hype machine appears to show no signs of slowing down. Rage 2 will launch on PlayStation 4, Xbox One, and PC on May 14, 2019. Head over to the official Bethesda Softworks website for more information. Bethesda recently confirmed that they will continue to support the Steam digital storefront despite many other game studios taking their talents to Epic Games Store in recent months. Is today's announcement of the He's One Fire mode for Rage 2 enough to get you to pre-order the game? Let us know in the comments section. Keep it locked on Shacknews for everything Rage 2 and id Software leading up to the game's release next month. I wish his quips sounded like the stand up arcade game and not the console versions.